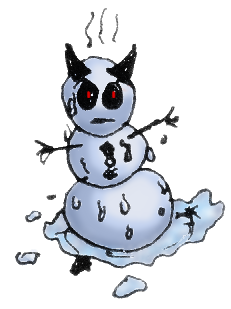 Bad form for a devil to be made out of snow... the heat - the wet ice, all sounds a bit drippy to me. This was a sketch I did, scanned in, and coloured using Paint Shop Pro. Suprisingly easy and kinda fun to do. All I did was stick the outline on one layer and colour in beneath it. I added the glint in the eyes on top too.